In a vote of 378 to 46, the U.S. House of Representatives voted to pass a short-term tax extenders package (HR 5771) Dec. 3 that would reinstate the biodiesel tax incentive retroactive to its expiration on Jan. 1, 2014, through the end of this year. The revolutionary Viesel Skunk Works Continuous Enzymatic Process provides for simpler, faster conversion of cheap feedstocks to make biodiesel. In collaboration with Tactical Fabrication and Novozymes, the process will soon be offered commercially. 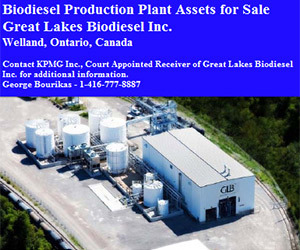 Renewable Energy Group Inc. and IC Green Energy Ltd. announced Dec. 9 that REG, through a wholly owned subsidiary, will acquire ICG's majority equity ownership position in German biodiesel producer Petrotec AG. Closing is expected by year's end. The app's features include a searchable index of the EPA's Code of Federal Regulations (Title 40, Part 80), one of the most visited set of regulations by fuels industry professionals. The app allows users to search the full text of the regulations. Cavitation Technologies Inc. (CTi) announced this week that the Desmet Ballestra Group, CTi's strategic partner since 2010 and licensee of CTi's vegetable oil refining technology, has entered into another sales agreement in India. Boeing powered its ecoDemonstrator 787 flight test airplane with a blend of 15 percent green diesel in the left engine. With 800 MMgy capacity in the U.S., EU and Asia, green diesel could supply 1 percent of global jet fuel demand.